Have you ever been wronged by someone? I mean really hurt in such a way that, even years later, it still comes to mind and still eats at you? If you have then you know that this type of injury cannot be inflicted by any but those that we truly care for. If you can relate to this at all then you are probably at this moment thinking of someone that is or was very close to you. Perhaps you are thinking of a brother or a sister, your mother or father, maybe a best friend, or perhaps your spouse. It’s possible that this injury is something that the person has apologized for but their apology just didn’t quite ring true. Or maybe they don’t even know that they hurt you. Or perhaps it is something that has been ongoing for years; perhaps an abusive relationship of some kind or maybe the person in question is just plain mean, self-centered, and rude. How are we to handle these types of situations? Should we just shut down and ignore the situation? Should we end the relationship and try to save ourselves further torment? We all know that there are two sides to every story and none of us, as much as we would like to think we are, are blameless in these things. So then, are we to focus on ourselves, on our own shortcomings, and ignore the wrongs and the bad behavior inflicted on us? We’ve all heard the Christian commandments that we are to honor our mother and father and that we are to love our neighbor as ourselves. We are also all pretty well aware of the Golden Rule: do unto others as you would have others do unto you. I think that these concepts provide a foundation for how we should approach this issue. The kingdom of heaven is like a king who wanted to settle accounts with his servants. As he began the settlement, a man who owed him one million dollars was brought to him. Since he was not able to pay, the master ordered that he and his wife and his children and all that he had be sold to repay the debt. The servant fell on his knees before him. “Be patient with me,” he begged, “and I will pay back everything.” The servant’s master took pity on him, canceled the debt, and let him go. But when the servant went out, he found one of his fellow servants who owed him a few dollars. He grabbed him and began to choke him. “Pay back what you owe me!” he demanded. His fellow servant fell to his knees and begged him “Be patient with me and I will pay you back.” But he refused and instead had the man thrown into prison until he could repay the debt. When the other servants saw what had happened they were greatly distressed and went and told their master all that had happened. We are, all of us, imperfect creatures. We make mistakes and sometimes we hurt others. Sometimes on purpose and sometimes without ever knowing it. We all require forgiveness. God, in his grace, has granted us the forgiveness that we so require. In return he demands that we forgive others as he has forgiven us. No matter how numerous or hurtful their actions may have been. We are to forgive them from our heart. Jesus also taught us how to pray. In that prayer, commonly referred to as the Lord’s Prayer there is a line: Forgive us our trespasses as we forgive those who trespass against us. Think about that line for just a moment. Lord, I want you to forgive me for my sins in exactly the same way that I forgive those that have sinned against me. Ask yourself these two questions: 1) Am I really ready to be judged based on that standard? 2) How would my relationship with the person in question be different if I were to, without even saying anything to them, truly forgive them in my heart for everything they have ever done to hurt me? When Jesus told Peter not to forgive his brother seven times but seventy times seven times he meant that we are never to give up on those that may hurt us. We are to forgive them over and over and over again just as we are forgiven through the grace of God. Does this mean that all of our relationships will turn around and be miraculously healed simply because we have forgiven the other person, or that once they see how we have changed they will never wrong us again? No. But it does mean that, whatever happens in our relationships, we can go to our maker with a clear answer to that first question. 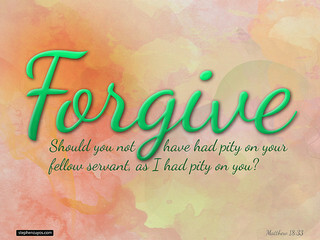 Yes Lord, I am ready to be forgiven for my sins against you in the same way I forgave those that sinned against me.